Hi crafty friends! Welcome back to my blog! Hope you're having a wonderful day. For today I have a new coffee card showcasing the Caffeine Addict stamp set from SugarPea Designs. This time I chose the inspiration photo for my card and I begun by die cutting a white panel with the largest stitched rectangle from Simon Says Stamp. Then, I stamped in Distress Ink Black Soot the coffee cup all over the panel in a random pattern. 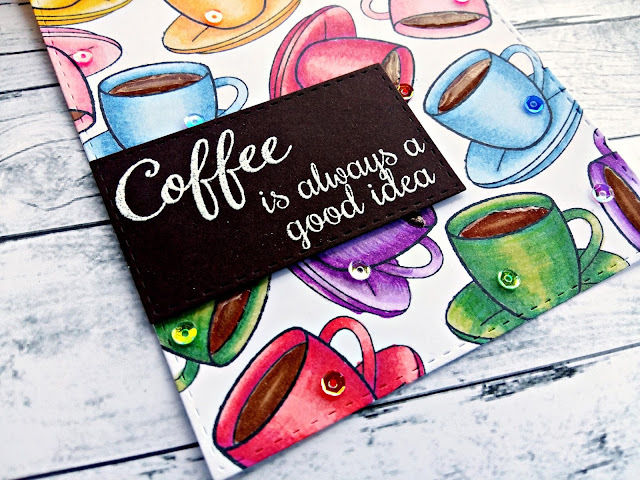 I colored the images using Nuvo markers and I added glossy accent over the coffee portion. I stamped the sentiment on a brown piece of cardstock in VersaMark and white heat embossed it. I added the sntiment on the panel and I glued a few sequins from Crystal Rainbow Fusion pack by Studio Katia. Absolutely gorgeous mix!!! I adhered the panel on a white card base and my card was done. I hope you like my card and you got inspired! 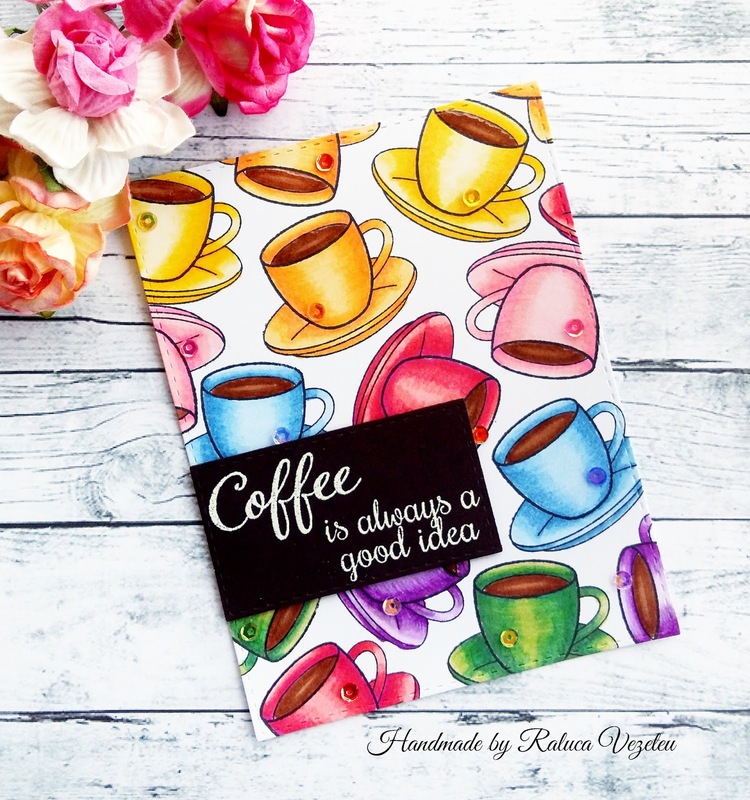 Cute design Raluca, the black and white sentiment over the colorful cup make it all pop. Love your rainbow of coffee cups! The shine on the coffee is the perfect finishing touch! Thanks for playing along with us at SugarPea Designs! You so rocked this challenge Raluca! I love your card with all the color. You inspire me. So happy you joined us at SugarPea Designs. Beautiful colouring, these coffee cups are amongst my favourite SugarPea creations. 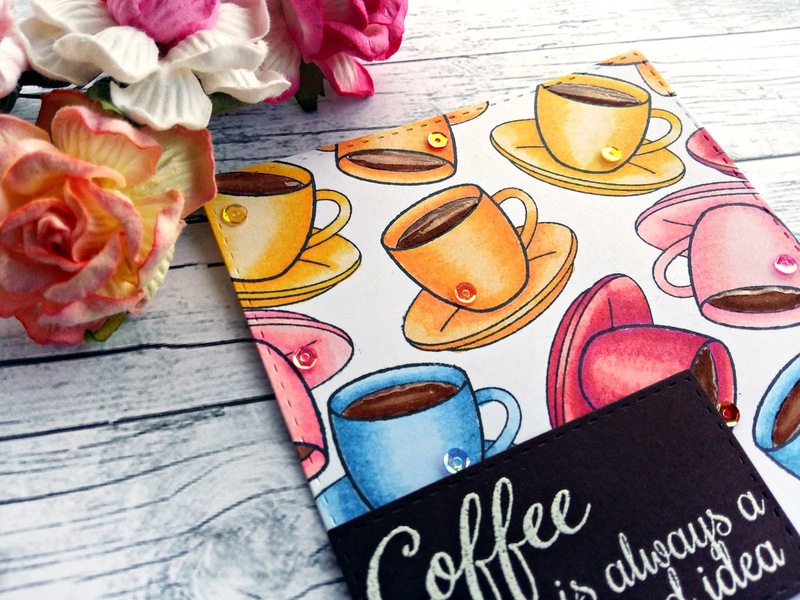 Thank you for sharing with us at SugarPea Designs!